The Taj Mahal Palace is a five-star hotel in the Colaba area in South Mumbai. It came into world news when it was attacked by Pakistani terrorists on 26th of November 2008. Jamsedji Tata built it in 1903 during the British Raj. At the time there were no decent hotels that Indians could go to in their own country as Indians were not allowed by the British rulers into the good hotels. This hotel fulfilled a strong need amongst the rich and the elite Indians of the time. 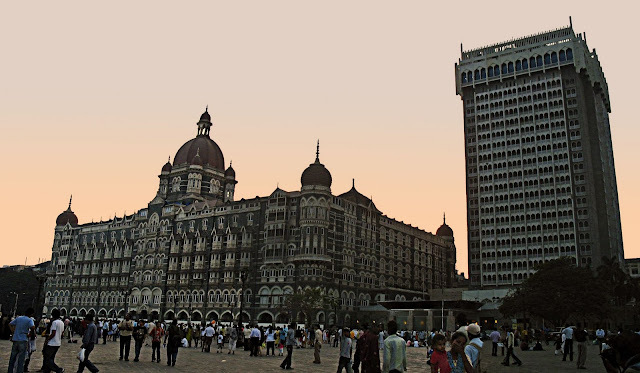 This photo is of both the old and new Taj Mahal Hotel in Mumbai. The Taj is iconic for the Taj hotel chain as it was the first for them. It is also an icon of Mumbai, and a heritage building. The building you see on the right of the photograph is the new wing of the Taj Mahal Hotel. Both these photographs were taken at dusk and therefore the dull lighting. The people around the hotel are tourists but they have not come to see the hotel. They have come to visit the Gateway of India, a monument directly in front of the Taj bordering the sea. If you want to see pictures of Mumbai skylines and skycrapers try these posts: Mumbai Skylines - Nariman Point and Malabar Hillor Mumbai Skylines - Worli. For an heritage building try this one: VT or CST railway station in Mumbai or just click the label "Mumbai" for more photos of Mumbai.